Now this is the suit we’ve been waiting for. There’s a lot riding on Halvarssons getting it just right. And that’s because it’s the highly-anticipated replacement for the much-loved Prime and Prince suit. Now the Prime and Prince have been in the Halvarssons range for the last five or six years. And in that time the suit has become a firm favourite of ours. It has also become Halvarssons’ best-selling combination of all time. The Prime is the most comfortable of jackets. With its elasticated side straps it fits almost everybody. It’s warm, it’s waterproof and, if the unthinkable happens, it’s extremely protective. And that’s because of its Hi-Art abrasion-resistant lining. Hi-Art is not an aramid, but it does the same kind of job as a material like Kevlar. The Prime and Prince have been hugely important to the Swedish company, and they know that if the new suit isn’t better than the old one, they’re going to look a little silly. It’s why it’s taken them so long to bring the Wien to the market. It had to be right. 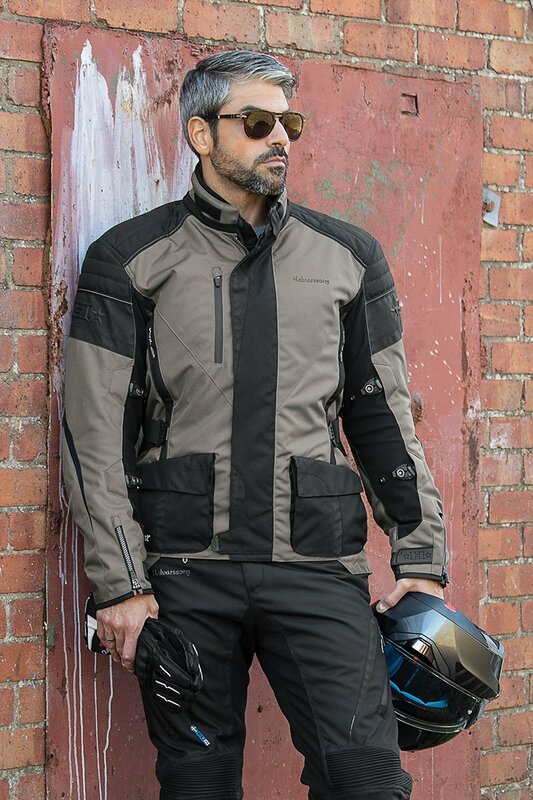 Well, we’ve been testing the jacket secretly over the summer and, although we clearly haven’t seen how the jacket is going to fit all our customers, we have to say that our first impressions are very positive. In fact, we’re more than cautiously optimistic. We think Halvarssons has cracked it. The basic principles of the new Halvarssons Wien jacket are the same as the Prime. That is to say that it is a drop-liner jacket, and not a laminated one. Obviously we know that laminate gear is all the rage right now. And for good reason. In certain conditions, a laminate jacket performs better. If you find yourself in heavy rain, for four or five hours or more, a laminate jacket will not wet out. The other benefit of a laminate jacket is the speed with which it will dry out. After an hour or two in heavy rain, a laminate suit will dry out in a matter of minutes. It may take a few hours or more for a drop-liner to do the same. But whilst a laminate garment has its strengths, it has a number of weaknesses. A laminate jacket will never be as comfortable as a good drop-liner jacket. And that’s because, when you laminate a membrane onto a fabric, it becomes stiffer, and therefore does not mould to the body as well. 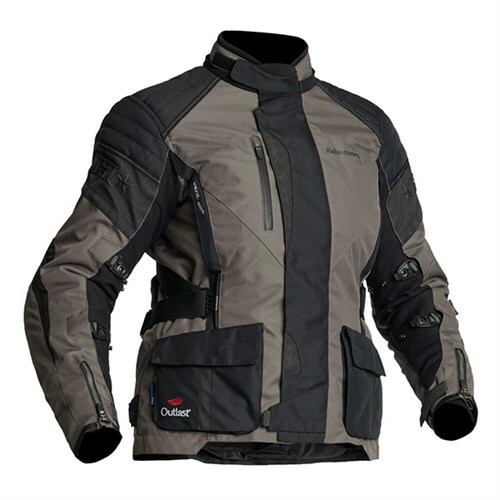 A drop-liner jacket is also warmer than a laminate jacket, and that’s because when the waterproof membrane hangs independently in a garment, it creates an additional air layer. And that layer of air traps heat generated by the body. 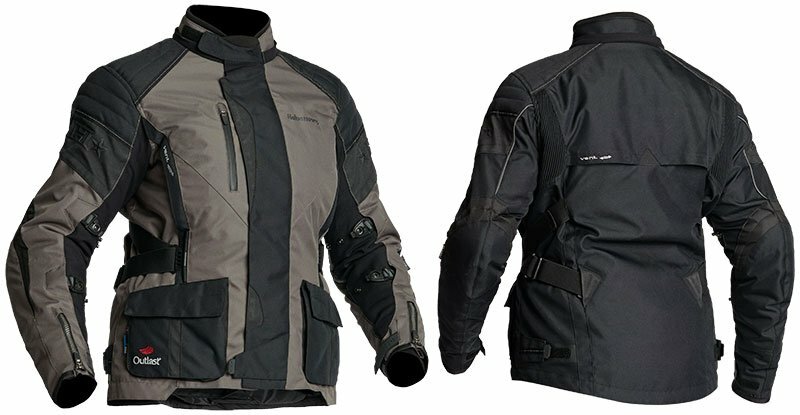 These days a lot of motorcyclists think they need a laminated jacket. And many convince themselves they want one because they know it performs better in the wet. 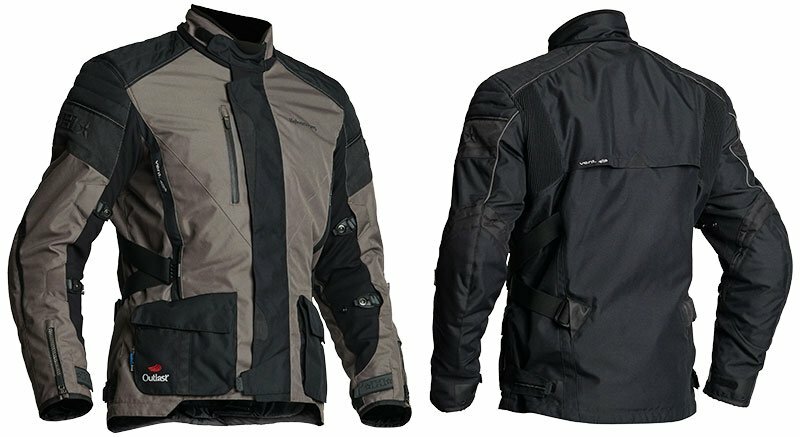 But the truth remains that, for most of us, for 95% of motorcyclists, a good-quality, drop-liner jacket is a better proposition. It is more wearable, more comfortable and more usable. Most of the time, it is just as waterproof. And it will be warmer. And the Halvarssons Wien jacket is not just a good-quality drop-liner jacket; we reckon it’s a brilliant quality, drop-liner jacket. The first thing we should point out is that the new Halvarsson Wien jacket is CE approved, whereas the old Prime isn’t. We’ve been told that the Prime would probably have passed the test if Halvarssons had submitted it, but what we can say with some certainty is that the fabric the Wien is made from is stronger and more abrasion resistant than the fabric on the Prime. The Wien is, in our view, a stronger and safer jacket to ride in. The fabric is still not as heavy duty and stiff as the fabric you find on some jackets, however, and that’s because, like the Prime, the Wien is also lined with Hi-Art. Like the Prime jacket, the Halvarssons Wien jacket has elasticated straps at the sides. This is hugely important in getting a perfect fit. It was one of the features of the Prime that we loved. And we are pleased, relieved indeed, that Halvarssons has included a similar arrangement on the new jacket. In fact, the system on the Wien is even more versatile and adjustable. It’s still early days to be definitive about how the new jacket is going to fit. We’ve been riding in a 52 size, and all we can say is that it fits very comfortably, but with a snug, reassuring feel. Everyone here who has tried it, likes it. It seems to be one of those jackets that just works. The Prime always did and, in truth, we would have been surprised if the Wien didn’t. 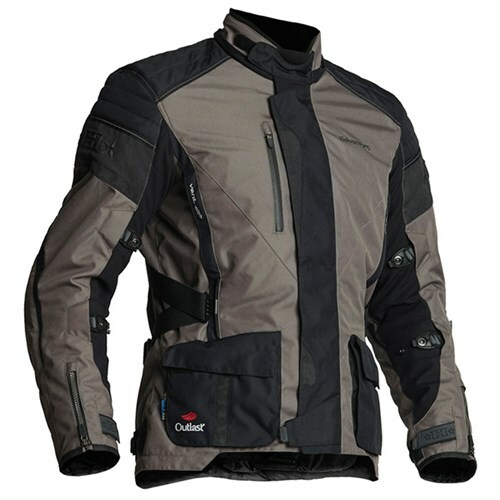 The jacket is medium length; certainly it’s longer than a sports or racing jacket, but it is shorter than most adventure jackets. It’s the perfect length for touring and commuting, we would suggest. For warmth, the Wien comes with a zip-out, inner Outlast jacket. 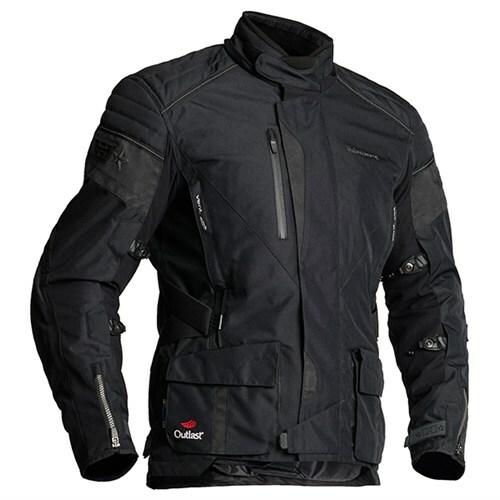 Now the Prime had a similar jacket, but this one we prefer because you can zip up the front and wear it as a standalone jacket, which you couldn’t with the Prime’s inner jacket. 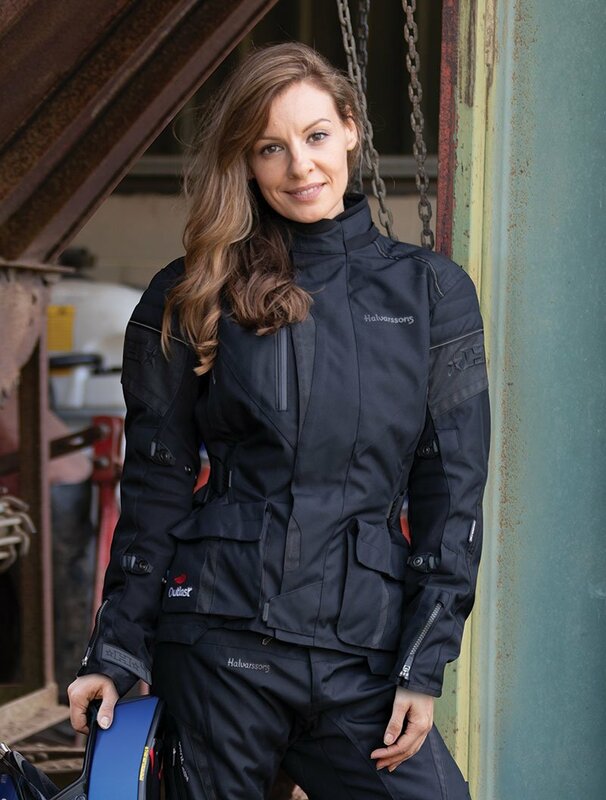 And even though the inner jacket still zips into the outer one, we reckon it will work better when you zip the inner jacket itself up, because there won’t be a gap up the front that will let the cold air in. It’s a small thing, but we think it represents an improvement over the Prime. The Wien's inner jacket doesn’t rely solely on the Outlast jacket for warmth. The Prime’s outer jacket also contained Thinsulate. The Wien uses Innoborn instead of Thinsulate. It does the same job. Halvarssons tell us it’s better than Thinsulate. But, of course, they would say that. We cannot really comment. Ventilation is, we reckon, going to be better on the Halvarssons Wien jacket than it was on the Halvarssons Prime jacket. There are two vents on the front and a large exhaust vent in the back. They are bigger, and better placed, on the Wien than they were on the Prime. Waterproofing comes courtesy of Halvarssons’ latest Dry Way 2.0, drop-liner membrane. And we should here perhaps reiterate, once again, the difference between a laminate and a drop-liner membrane. A drop-liner membrane is the same as a membrane that you would find in a laminate jacket. And it will keep the rain away just as well. In three, four or even five hours of rain you won’t get wet in the Wien. The difference is that after three or four hours in the rain, the Wien will start to feel a bit heavy as the outer material absorbs water, and this might cause you to feel a little cold. But, for most of us, these conditions are very extreme and very rare. The Wien jacket has also been waterproof treated. This will initially stop the rain soaking into the jacket, but in heavy rain the treatment can and will be overcome. But it does help, and by washing the jacket and re-proofing it every now and again, you will keep the jacket as waterproof as it can be. Like the Prime, the Wien has a removable waterproof and windproof collar. You’d probably take it off in the summer because you will want the air flow. 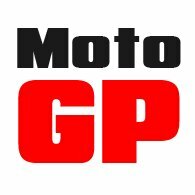 But in the winter months, it will reduce the wind-chill effect; and it will also soak up the rain as it runs down the helmet and tries to get into the neck. One area where the Halvarssons Wien jacket is definitely better than the Prime is in the armour department. The armour in the Prime was Level 1. The armour in the Wien is Level 2. It’s more shock absorbent, yet if anything it’s more comfortable. Now, Halvarssons has changed the way it does back armour. It is now held in place with Velcro, and apparently this helps because it prevents the material from puckering at the neck. But we do not like their back protector. We do not like it at all. It’s as thick as a surfboard, and just as heavy. In fact, we never liked the Prime’s back protector either. It was produced by Forcefield for Halvarssons, and it was a bit old school. But what we do like is D30, and so we’ve had a number of D30 back protectors stitched with Velcro so that they will work in the Wien. You can go for Halvarssons’ back protector but, honestly, it’s nowhere near as nice as the D3O one, and it’s much more expensive. The back protector doesn’t come as standard; it’s an extra. Obviously, the jacket will zip into any Halvarssons pant. You get loads of pockets inside and out; the most waterproof of which is the internal Napoleon pocket. You get volume adjusters at the sleeves; so that they can be reduced in size when you remove the Outlast jacket. There are loads of reflective panels all over the jacket, but the main areas on the shoulders will light up like a road sign. At night this material is pretty amazing. In addition to the elasticated straps up the flanks, there are Velcro adjusters at the waist. You also get adjusters at the ends of the sleeves, along with a zip fastener. This enables the sleeves to be opened up, so that you can wear your gloves inside the sleeve cuffs, as obviously you should do with a jacket like this. What the Wien does not have that the Prime did, is a zip-in hi-vis vest. It was a neat and useful device, and we liked it. It would seem that Halvarssons’ number crunchers were perhaps not quite so so keen on it. But, in our view, it’s not a huge loss. If you want hi-vis, we would go with Rukka’s fantastic stretchy and breathable vest. It’s the best; it’s done in loads of sizes and is totally breathable. The only problem is that the Rukka vest isn’t cheap. Which brings us to one other slightly thorny subject: the pants. Now, there’s a Wien pant that matches to the Wien jacket. It uses the same fabrics, membrane and thermal liner. It’s what the Wien was designed to go with. But, as with the old Prime, we have already decided that we have a preference for pairing the new Wien jacket with the existing laminated Wish pant. Now this might seem a little bizarre, having proclaimed with such vigour the benefits of a drop-liner jacket. But we simply love the Wish pants. It’s a very flattering pant that fits really well. You will get the waterproofing benefit of a laminated product and. although the Wien pant might, in the margin, be warmer than the Wish, we slightly take the view that it’s more important to keep the core and upper body warm than it is the legs. 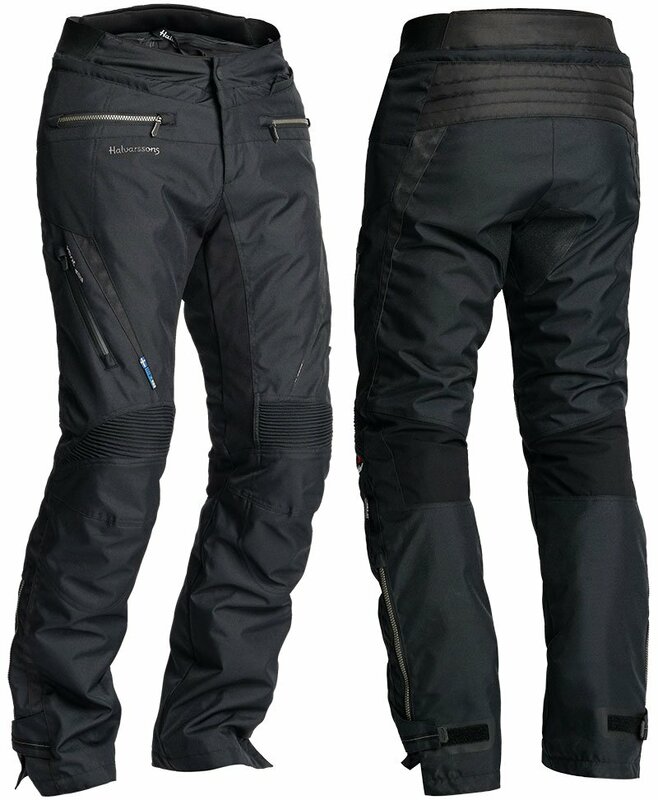 And whereas we would suggest that the drop-liner Halvarssons Wien jacket is appreciably more comfortable than Halvarssons’ laminated Wolf jacket, we wouldn’t draw the same distinction between the laminated Wish pant and the drop-liner Wien pant. 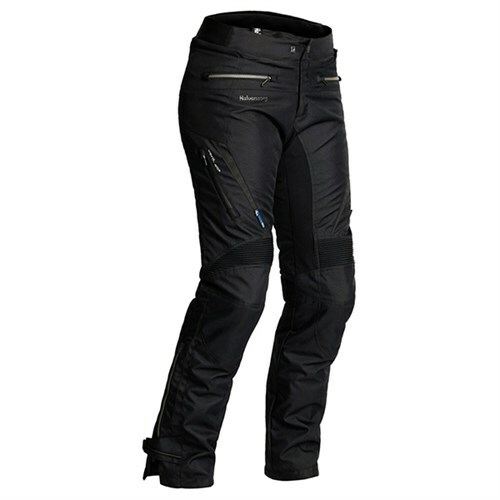 The Wish trouser is every bit as comfortable as any drop-liner pant we have ever ridden in. So there we have it. Only time will tell whether the Wien is as popular, and as universally well fitting, as the Prime. But the initial signs are encouraging. In a very few specific areas the Wien jacket not as good as the Prime. But, in our view, those areas are more or less insignificant. By contrast, however, the Wien is an improvement over the Prime in a number of regards. 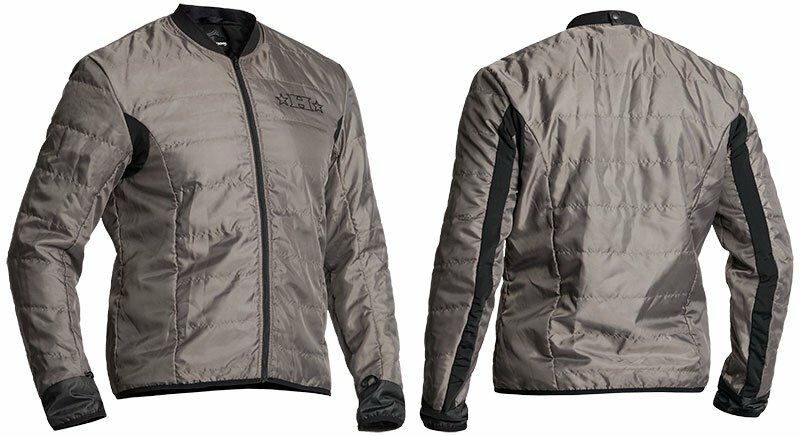 If you’re looking for a comfortable, safe, well-fitting jacket that does pretty much everything, then you should give some consideration to the Wien. 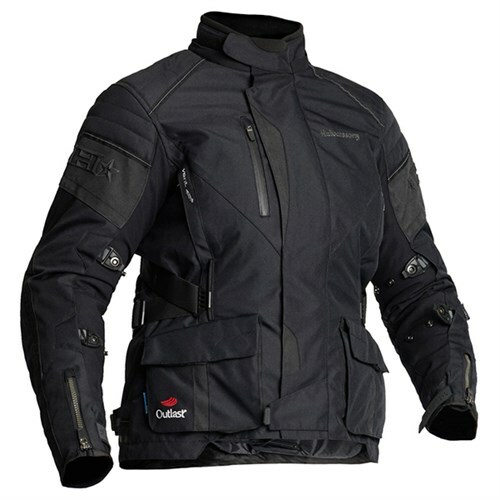 You’d probably need to be commuting an hour each way, every day, all year round to reach a position where the laminated Wolf jacket was considered preferable. The same might apply if you ride 15,000 plus miles a year. For the rest of us, the Halvarssons Wien is probably the perfect jacket. Which brings us to the final point: price. The Wien, as with all Halvarssons’ garments, is very well priced. It’s high-end gear at a mid-market price. We often talk about Halvarssons’ garments being 90% Rukka quality for 50% Rukka money. And we stand by this assertion, although it has to be acknowledged that the Halvarssons two-year warranty lags behind Rukka’s six years. The Wien jacket, which comes in two different colourways, costs £449. The Prime jacket was always £459, although when Halvarssons decided not to have it CE approved, they did reduce the price a little. The Wien pants are £345. 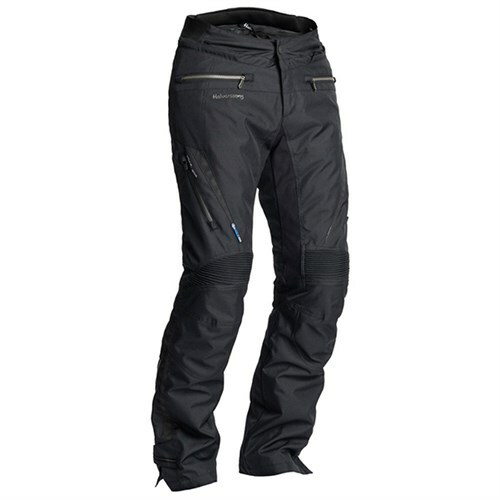 The laminated Wish pant, which we prefer, and which we would recommend to go with the Wien jacket, costs £399. So, for £850, you could get what we consider to be the perfect pairing. If you went for the matching pair, the cost would be just under £800. The Velcro D30 back protector that we infinitely prefer would be £50 extra. 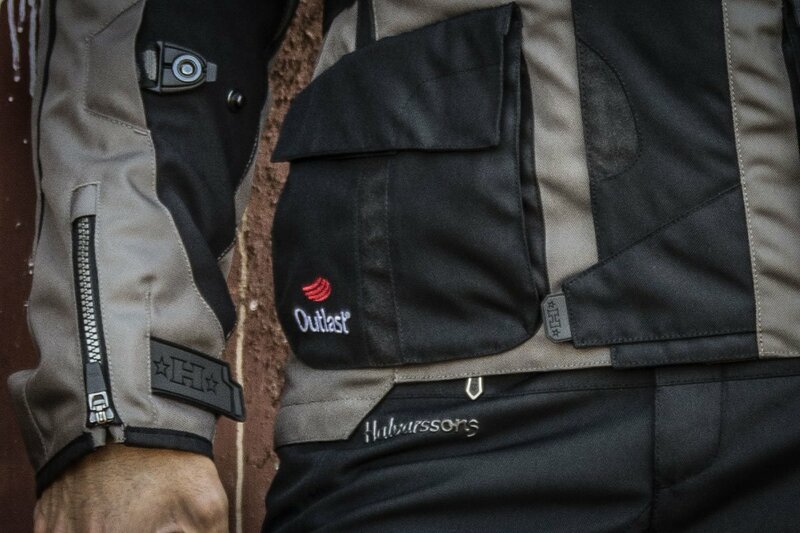 Halvarssons’ own back protector, which could also double as a wake board, is £60. Buy our preferred Wien and Wish combination, with our recommended D3O back protector, and you’re still only at £900. Even if you added in the brilliant Rukka Hi-vis vest, you’d still come in at under a grand. Just! Anyway, the only way to know if the suit is right for you is come and see us and to try one on. Obviously, we’ll be aiming to keep them permanently in stock in all sizes. So come and see us. We wrote this article in early January. Delivery is expected in mid-February 2019. It might arrive sooner. Click Halvarssons Wien to shop the Halvarssons Wien.